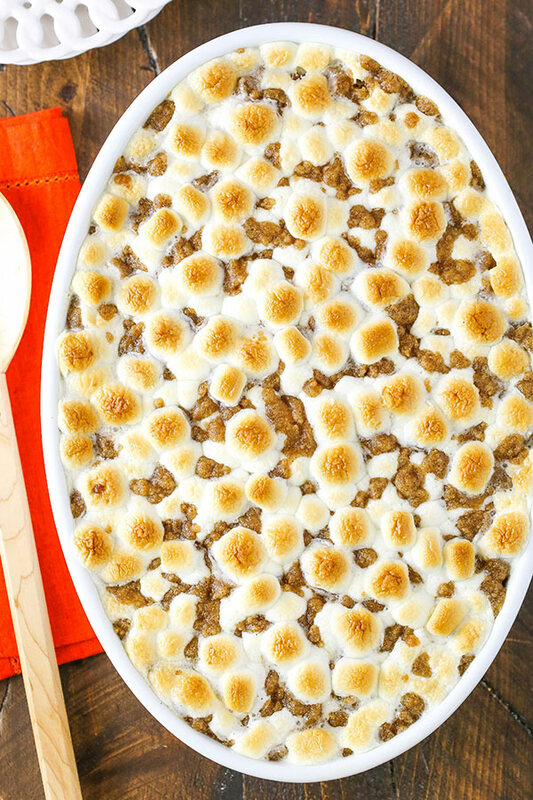 This Sweet Potato Casserole is loaded with brown sugar, cinnamon and nutmeg and topped with toasty marshmallows and cinnamon streusel! It’s the perfect compliment to your Thanksgiving meal! My favorite part of any holiday meal is always the sweet potato casserole. Always. It’s basically earmarked for me. And depending on the number of people joining us for the meal, we may even need to make me my own separate one. At the very least, about half of the casserole is mine. It just is. 🙂 If you take my casserole, you might get some seriously dirty looks. I love it. And it makes sense – it’s like dessert that’s called a side. My kind of side! 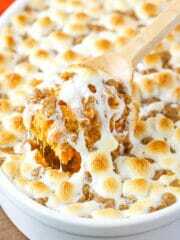 Growing up, we always made a more traditional sweet potato casserole with marshmallows and used canned sweet potatoes. It’s what I’ve been making for years, so of course I’m a fan. But lately I’ve been thinking it’d be fun to switch it up. Plus, I’ve been really enjoying fresh sweet potatoes these days and wanted to incorporate them into a new sweet potato casserole. 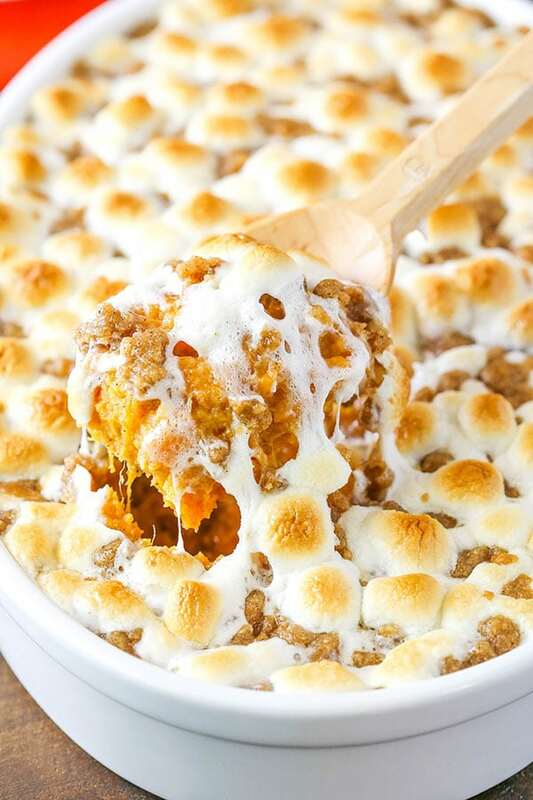 So I decided to ramp up my traditional version and make it even better with fresh sweet potatoes and a combination of marshmallows and streusel. If it’s possible to make sweet potato casserole better, it’s definitely with streusel! To make this sweet potato casserole, you’ll start off by making the homemade mashed sweet potatoes. Peel and chop up the sweet potatoes and boil them in water until they’re nice and tender. Drain the potatoes and mash them until they’re how you like them. I’m a fan of a pretty smooth mashed sweet potato, but feel free to leave some chunks, if you like. Next, add your milk, butter, eggs and seasonings. 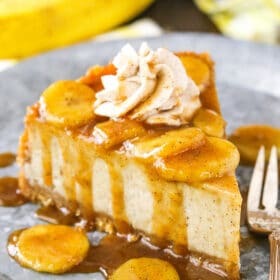 I’ve used plenty of brown sugar, cinnamon and nutmeg, plus some vanilla extract for the ultimate in flavor! Plenty of sweetness and plenty of spice. 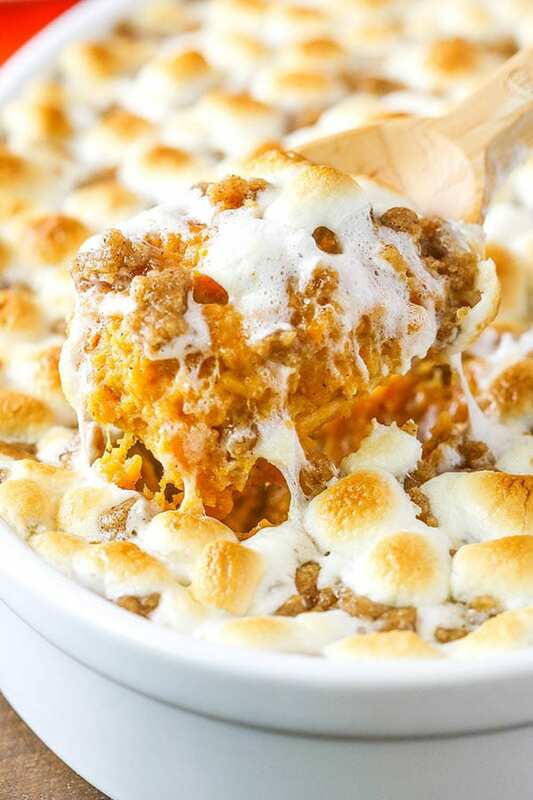 Just the way sweet potato casserole should be! To take things to the next level, it’s time for the topping! While you could always just go with marshmallows on their own, the streusel really ramps things up. A little more sweet, a little more cinnamon and nutmeg and a lot more yum! The casserole is baked in the oven prior to adding the topping, then the topping is added for the last 10 minutes or so. 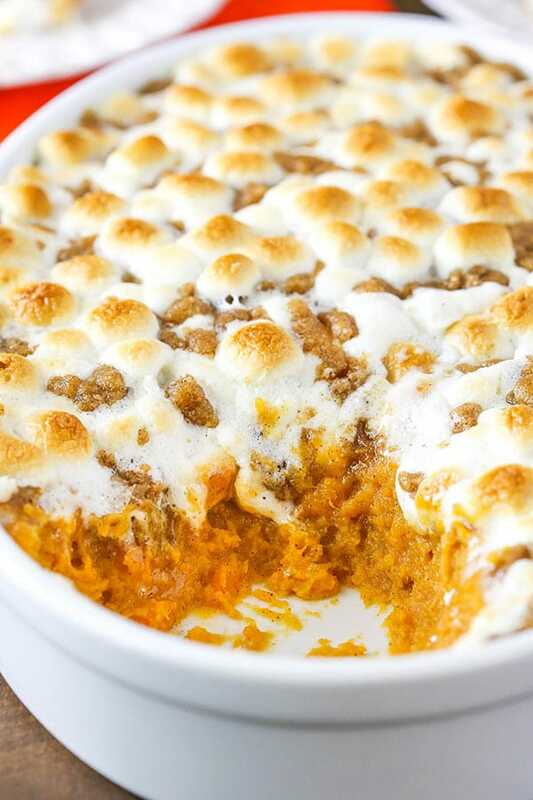 CAN SWEET POTATO CASSEROLE BE MADE AHEAD? 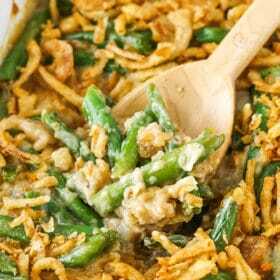 One of the great things about so many Thanksgiving casseroles is that they can be prepared ahead of time – this one included. The sweet potatoes can easily be prepared and combined and added to the casserole dish a couple days ahead. Just cover the dish and store in the fridge until you’re ready to prepare it. You can either bring the casserole to room temperature before heating it, or put it right in the oven. Just keep in mind that if you put it straight into the oven, it might take a little more time to heat through. Even the streusel can be made ahead and then added to the casserole when the time comes. Score! This Sweet Potato Casserole is loaded with all that’s good and it makes the best Thanksgiving side dish! It’s a great way to spice up the more traditional sweet potato casserole and incorporate fresh, homemade mashed sweet potatoes. The sweet marshmallows and streusel are totally delicious! I hope you enjoy it! 2. Put the sweet potatoes in a large pot and cover with water. Bring the water to a boil and boil until the potatoes are fork tender, about 8 minutes. 3. Drain the potatoes and return to the pot. Mash the potatoes until they are your desired level of smoothness. 4. Add the milk, brown sugar, butter, eggs, cinnamon, nutmeg, vanilla and salt to the potatoes and stir until well combined. 5. Pour the potatoes into a 9×13 casserole dish. At this point you can cover the dish and refrigerate for up to two days before cooking, or you can put them in the oven right away. Heat them until cooked through, 25-30 minutes (might take less time if you’re cooking them right away). 6. While the potatoes are cooking (or you could also prepare this ahead of time), combine the flour, brown sugar, cinnamon, nutmeg and cloves for the streusel topping. 7. Add the melted butter and stir until well combined. 8. When the casserole is heated through, remove it from the oven and top it with the marshmallows and streusel. I like to add some marshmallows, then the streusel, then the remaining marshmallows. 9. Bake for another 10-15 minutes. If you want to brown the marshmallows a little more, turn the oven to the broil setting at 400 degrees until they’ve browned to your liking. Serve casserole warm. Thanks for the recipe Lindsay! I love the top view of this casserole. I will consider it in my Thanksgiving meal! 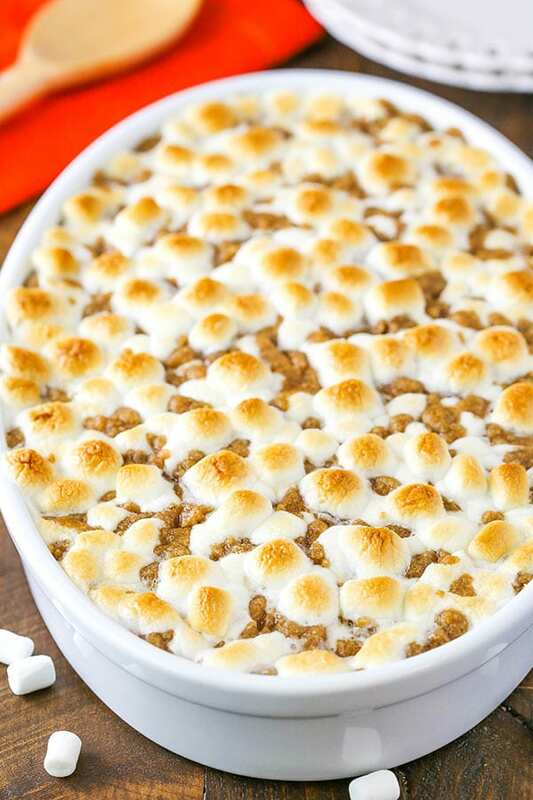 Best sweet potato casserole ever hands down!! Made it for Thanksgiving today and everyone raves about it, including my husband who likes a good sweet potato casserole! Thank you again for a 5 star recipe!! I’m making it for tomorrow too! !